Things I liked: They are perfect for my purpose. What others should know: I really like Leapers/UTG products. You will too if you try them. Things I would have changed: The see-thru feature is useless, you can only see the sights if you left the scope off the rings, the front objective block the viewing tunnel so it defeats the purpose of having see-thru rings. What others should know: These rings are cheaply made and not the best quality as the first set of rings damaged my scope's finish. They were machined out of round so that when I torqued the screws to the factory recommended 15in/lb with my torque wrench, they gouged off the finish on the right side of the scope (on both the front and back ring locations). I sent these back and asked PA for a refund but they sent me another set instead, so you can imagine how upset I am that not only will I have lost $8.50 to send back the damaged scope and rings, I'll have to risk damaging the new replacement scope again with these crappy rings. The replacement rings are almost as bad as the first ones, I didn't torque them to the recommended 15in/lb because I didn't want to risk distorting the rings and damaging the finish again. So I torqued it to 10in/lb and the damn scope keeps creeping back in the rings and it's rotating due to the sever recoil and twisting of my Ruger Air Magnum. I tried to torque the horizontal Weaver rail screws to the recommended 35in/lb and it bent the crap out of the screw on one of the rings, but the other ring screw is fine at that torque, so one screw was definitely not properly heat treated. Mind you, I didn't use a ft/lb wrench divided by 12, I used a dedicated in/lb wrench so the torque I set was very exact. These rings are absolutely useless and I definitely would not use the recommended factory torque settings as you'll probably damage your scope or the rings. Better yet, just spend a bit more and buy better quality rings instead. I wish PA would have refunded my money (and covered the return shipping) so I could have bought better mount instead, now I'm stuck with these useless pieces of junk as I'm not going to spend more money sending these back again. These rings are not worth the money I paid, and I wish I could have given these a ZERO stars if it was possible. Things I liked: Perfect for my new Marauder setup. Things I liked: Very well made. Rock solid mounting. Things I liked: These are sturdy, solid, rings. They look great as well, and have a non-slip finish or adhesive inside the ring. These are all you will ever need. Things I would have changed: Nothing. The fit, finish, and construction are equal to anything I have seen. Things I liked: good high rings I use these on my hatsan 125 with my Hawke Sport Optics HD IR 3-9x50 AO Rifle Scope, Ill. Mil-Dot Reticle, 1/4 MOA, 1" Tube scope, very good with this combo so far. Things I liked: They are built very well. Honestly, I own Nightforce and Leopold Mark 4 rings in this same configuration and they cost in the hundreds and these are just as good at a fraction of the cost. What others should know: Before you mount any aluminum parts, take the screws all the way out and apply lubricant to the screws to prevent galling and get a consistent torque value. Pyramid is awesome in all respects and my go to "first" people. Other companies need to take a class from them when doing business. Things I liked: I was using medium scope mounts that made the scope too low on the rifle. These high mounts for picatinny application worked perfect. 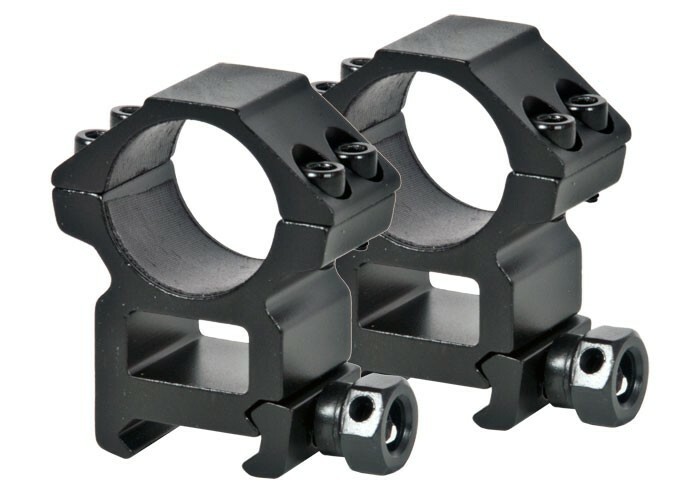 What others should know: IF you have a scope that is mounted too low, these mounts are the perfect application. Things I liked: These are great rings. They tighen down real well with the provided hex wrench. Easy to install. Very solid construction. What others should know: I have 4 sets of Leapers Rings and have had good luck with all of them. Things I liked: They are built like a BRICK outhouse. Extreamly well built! Things I would have changed: Excellent as is! What others should know: Buy them! Things I liked: good solid mounts. good value. Things I liked: The tape on the interior surface of the rings to prevent ANY slippage. Light weight, decent finish for the price. I have used these rings on a RWS 350 magnum, Ruger 10/22's and now 2 AR15's, all have work without issue and a fantastic bargain. Things I would have changed: Would be nice for the picatinny rail screw/nut to be of a little heavier alloy, as long as you do NOT over tighten you should be fine. Things I liked: I love Weaver base rings. Eliminates scope creep. Very economical. Well made. Things I liked: Solid for the money. The tape holds the scope extra tight. Things I liked: I like the look of these rings. They make my gun look even more diabolical. I also like the tape on the inside of the rings to prevent scratches on the scope and how the screws on the bottom don't ome completely out. What others should know: This is a problem with most two-piece scope mounts. On the gun, it is hard to get the scope to sit straight on the mount. Once you get right, your scope's not going anywhere.